can someone make a tutorial on how to work with this feature in FM 19? I didn't read it was possible before someone asked me . So i would know too how to get it . 1) Open FMSE19. Go to File > Options. Set your "Game Documents" folder. 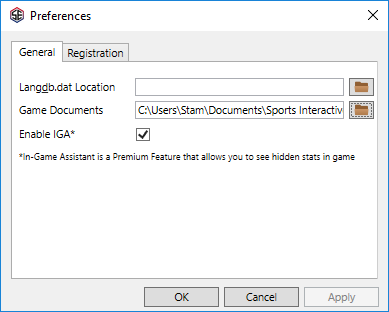 Then tick the "Enable IGA" checkbox. 2) Open FM19. Go to Preferences > Interface. Hit the "Clear Cache" button. Then return to the same screen. Below that button, tick option "Reload skin when confirming changes in Preferences" in order to make the "Reload Skin" button to appear. Then click that button. 3) Load your FM19 save. 4) Load the game in FMSE19. 5) Back to FM19, find any player and go to his Attributes screen. Learn to do a great tutorial. Selected the player folder in panels as the game documents and ticked the box. Cleared cache and done the skin reload numerous times. Restarted the game, restarted FMSE all to no avail like above. Just isn’t doing what it should be. How to activate IGA is already covered on the FMSE FAQ topic. 2018-10-26 19:48#251627 Stam : How to activate IGA is already covered on the FMSE FAQ topic. 2018-10-26 14:15#251611 shauneastham : Selected the player folder in panels as the game documents and ticked the box. Cleared cache and done the skin reload numerous times. Restarted the game, restarted FMSE all to no avail like above. Just isn’t doing what it should be. @MICASYT: Good shout. IGA is supposed to work with the default skins which have the required panel on the attributes screen. I use Wannachup for the instant result but yeh I've tried all 3 of the default skins, all Wannachup skins. My only theory now is maybe because my game is installed in my D drive and not C drive. But every other addon works with this setup. I've contributed to Genie Scout and possess 19g and the toolbar on hovering over the i works perfectly so I can see it there. Haven't a clue. You are reading "IGA doesnt work".